•Browse your product in the home tree and expand the Product versions category to see which versions of your product you've distributed with BLT for LabVIEW. 2.Copy Download link to clipboard: This displays and copies in your clipboard the direct download URL to access the product update zip archive on the Product Updates Server. 3.Delete the product version: This entry will be removed from the Licensing Server. Any user of this product version will be prompted to downgrade to the new latest version available. 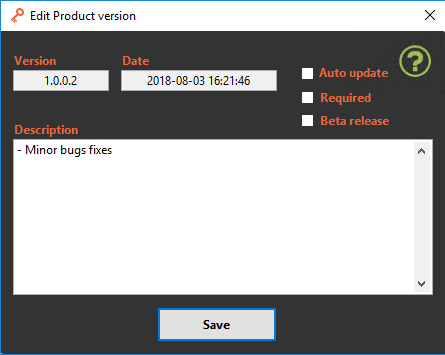 oSince the product update is directly linked to the version of the executable file, and since end-users are looking for product updates by product version's dates, you cannot change the Version and Date of a product version. You must delete it and redistribute your product with the correct product version attributes if you've made a mistake. oModify the Auto-update attribute if needed. oModify the Required attribute if needed. oModify the Beta release if needed. oYou can also edit the Description of the product version.